Looking back at Revelstoke 100 years ago, and at the the major impact the war raging in Europe had on the community. Nov. 11, 2016 6:00 a.m. It is difficult to imagine what Revelstoke was like 100 years ago, and to imagine the major impact the war raging in Europe had on the community. At that time, Revelstoke had a population in the city and district of close to 6,000 people, and was one of the largest cities in the Interior. Revelstoke was a major transportation centre, with the main line of the Canadian Pacific Railway passing through east to west, and a branch line south to Arrowhead, where steamboats connected with the West Kootenay region. The Great War in Europe had been ongoing since August of 1914, and by 1916, the death count was growing. Revelstoke had lost eight men in 1915, but by the end of 1916, another 27 had died as a result of the conflict. The Battle of Mount Sorrel took the lives of nine Revelstoke men, with six of them dying on one day alone, June 3, 1916. The men who fell at Mount Sorrel were Thomas Beach, Ernest James Candy, James Davenport, Judson Woodworth Eaton, Angus McLeod, Charles Robert McRae, Earl Pettipiece, George Smith and Burton Montcalm West. The museum has created profiles on all of the Revelstoke casualties, so we know something about each of these men. Charles Robert McRae was born in Revelstoke, and his family was well-known. The Revelstoke Review of July 6, 1916 had a lengthy write-up about McRae, as he had been working as a reporter for the Review before enlisting. The editor described his personal sorrow over the loss. Another 17 men from Revelstoke, Arrowhead and Malakwa died between October 2 and November 21 during the Somme campaign. They were Isaac Baird Archibald, Howard Henry Cooke, Francis Hannell, James Henry Hay, Ernest George Jessop, Maitland Percival Lane, Andrew Emerson Lee, Daniel William McDonald, Daniel Montgomery, Donald John Morrison, Frank Murphy, John Rushton, Robert Smith, Richard Arthur Switzer, John Robert Thompson, Elbert Clive Trafford and William Ernest Wilson. One more man, John Henry, died on Dec. 9 of illness in an English hospital. Back on the home front, the community was busy with efforts to support the soldiers, and to encourage local men to enlist. 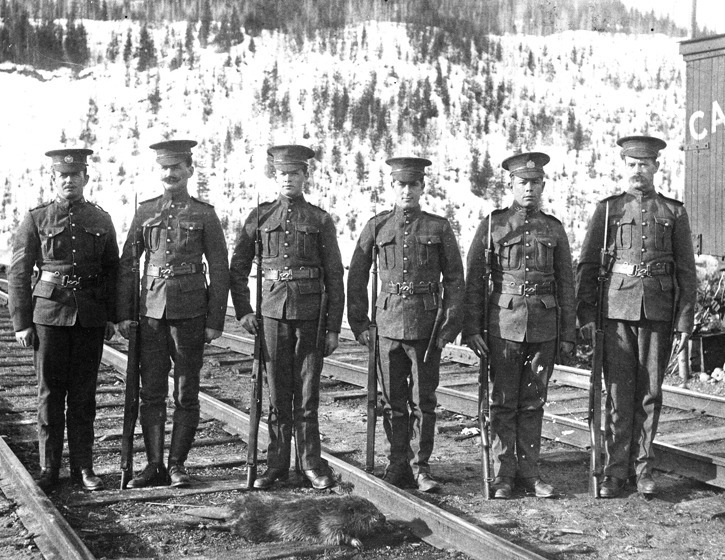 Local recruits continued to leave for overseas, and by the end of the war in 1918, more than 800 men from Revelstoke had served. Bridge guards were stationed on all of the Canadian Pacific Railway bridges on the main line to protect them from sabotage. Groups such as the Women’s Canadian Club and the Red Cross Society were active in fundraising efforts, and in knitting socks and sending letters and parcels to the soldiers. One woman, the elderly mother of former mayor William Foote, had alone knitted more than 150 pairs of socks. The women made sure every Revelstoke soldier had a pair of hand-knitted wool socks to take with them. At the Revelstoke High School, the boys had formed a cadet group, and the girls had started the High School Girls Patriotic Society, led by teacher Annie Eaton, sister of Judson Eaton, who had died at Mount Sorrel. They were also knitting socks, and sending letters and parcels to the soldiers overseas. Despite the mounting loss of life, the two local newspapers, the Mail-Herald and the Revelstoke Review, wholeheartedly supported the war effort, and the patriotism was evident in every issue. There was continued coverage of the comings and goings of the soldiers, and often letters home found their way into the pages of the newspaper. In 1916, Hector McKinnon was elected mayor, a position he held for several terms until his death in 1929. The business district suffered three separate fires, with the loss of several buildings. The Taylor block, located where Chubby Funsters Restaurant is now, burned down in March, and in May a fire destroyed the Climax Hotel, located on First and Campbell, current location of ReMax realty. A third fire in September saw the loss of the Star Theatre and the former Howson furniture store on Mackenzie Avenue near Victoria Road. These buildings were located where the parking lot is on the west side of Mackenzie. The second Winter Sports Carnival was held in February. This was the first time the ski jump on Mount Revelstoke was used. Local ski-jumping legend Nels Nelsen became the Canadian champion with his 1916 jump, and within a few years added the world record to his title. The ski jump on Mount Revelstoke remained in use until the mid 1970s. In other sporting news, the local YMCA had several active clubs, including a popular volleyball league. Their Royal Highnesses the Duke and Duchess of Connaught visited Revelstoke in July. The Duke was the son of Queen Victoria, and brother of Edward VII, former King of England. The Duke of Connaught formerly christened the Connaught Tunnel, which officially opened in December of that year, and also ascended Mount Revelstoke to plant a post as far up as the road had been completed, at an elevation of 3,921 feet. A provincial election was held in September, and on the ballot were two referendums – one on prohibition of alcohol sales in the province, and the second on women’s suffrage. Both referendums passed, and by April of 1917, the vote for women was ratified. Equal voting rights had long been fought for in the province, with the Political Equality League active in many communities, including Revelstoke. To learn more about Revelstoke during the First World War, visit the exhibit, “Answering the Call” at Revelstoke Museum and Archives and follow our blog at http://www.revelstokemuseum.ca/blog/ for profiles on Revelstoke’s fallen soldiers, or attend the talk at the museum on Remembrance Day.